Welcome, and we’re glad you’ve found your way here and are looking around. Things can be a big confusing, even for us, so we’d like to give you even more information in the hopes that some of it is helpful. I’ll explain the main search bar, then will dive in to some advanced techniques that you can use to narrow down the information you’re looking at to make sure it’s totally relevant for you. If you check out the top of the screen you’ll see the Navigation bar. It’s going to be your best friend. You’ll be able to find most any useful information right from that main bar. All our main categories are listed under our Explore heading. Here you’ll be able to search by Author, or by interest to find the things you’re most interested in. All the links in the Explore menu will lead to post categories containing our (awesome!) content. Anything and everything, this is how you can send us feedback directly. Let us know what you think, what you’d like to see, what you’d change if you owned the site, or even what brought you here and what will keep bringing you back. Beware of Richard getting to your feedback first – his first instinct is to send back a sarcastic witty reply that may or may not be super helpful. Odds go up if the questions are obvious or silly. You’ve been warned. The magnifying glass icon on the bar will let you search our site for whatever you’re interested in. Click on the icon and the search bar will appear. It’s a powerful tool and if it doesn’t find anything let us know and we’ll make some content just for you. If you want to see the newest posts from our various sections, click on the New Posts link and you’ll arrive at the New Posts landing page. 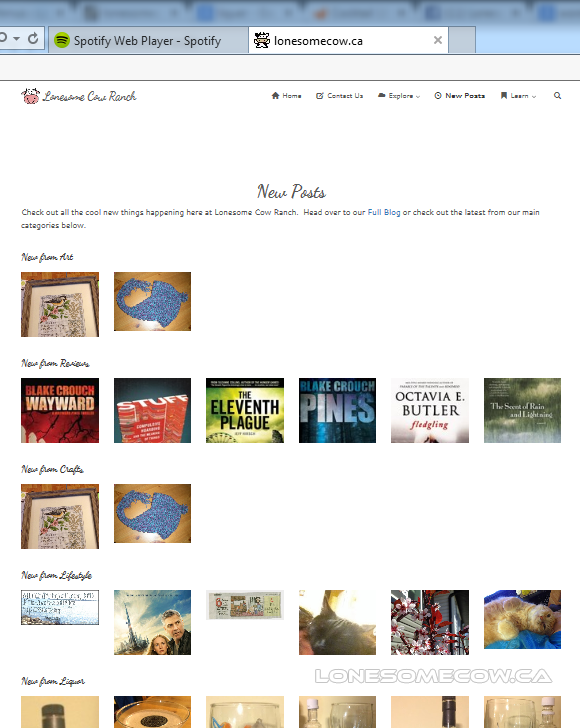 Here you’ll find (in helpful thumbnail sizes) the 6 most recent posts for all our main categories. Here you’ll find all the pages or information we’ve created specifically for you. Over time this section will expand as we start writing more helpful material. Check back here often – and make sure to let us know if you’re having trouble with something, or would like to know more about a subject that we’ve written about. While we do our best to make sure all our pages are accessible and easy to navigate, we know that we’ll never cover every possible search or browse query that exists. To that end I want to empower all of you to more easily find the stuff you want to know about. All our posts are tagged, and all our tags are searchable. What this means for you, is that you can compose a specific query to find the exact groups of posts that you want to read about. All you have to do is add a small query to our website in your address bar. Don’t worry it’s not scary! I’ll show you everything. We’re going to make a tag query and insert it up there. Let’s pretend I want to check out all our book reviews from the “fantasy” and “dystopia” genres. Those are both tags, so I can use them in my query. Press enter (or hit the go button) and you’re there! Now above I was looking for “fantasy” AND “dystopia” – which is a pretty narrow group. What if I was looking for “fantasy” OR “dystopia” – that’s much broader and maybe more what I was looking for. Well, that’s just as easy. That’s all there is to it. Now to get you off on the right track, I’ll give you a list of all our categories, and the tags that we’re using in them. Feel free to pick and choose ones that you want to know more about and put them together in a query. There is no limit to how many tags you can AND/OR include. NOTE – One small thing, you can’t combine commas and + signs in the same query. For whatever reason wordpress doesn’t like that and there isn’t anything I can do to make it happier.